At the moment, comics journalism is still a movement that's in its infancy. Joe Sacco is its progenitor and exemplar, but not all journalism involves international hot spots and war crimes. Josh Kramer is an interesting case to me because, like Dan Archer before him, he came to the Center for Cartoon Studies in an attempt to sharpen his skills as a cartoonist and storyteller in the service of his already keenly-developed skills as a journalist. As Darryl Holliday astutely observed in The Illustrated Press: Chicago, print may be dying off, but journalism existed before print and will continue to exist in new formats. Observing the world around you, telling the stories of others whose voices might not otherwise be heard and generally trying to connect reader to place and time in a direct fashion while offering new perspectives can and is being done in any number of ways. Comics journalism frequently lacks the immediacy of other kinds of journalism, but this can work to its advantage when comics seeks to provide reflection and thought. Let's look at a few different but allied examples of this in action. 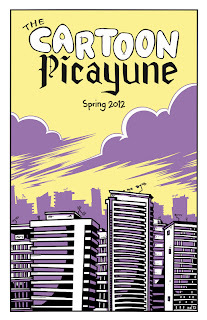 The Cartoon Picayune #3 and #4, edited by Josh Kramer. Kramer's modest but steadily evolving minicomic is the nexus of small-press journalism at the moment. Both Holliday and Warner printed stories in this tightly-edited, heavily sourced anthology. Kramer isn't against printing personal or less politically charge pieces, so long as they are up to the standards of the publication. 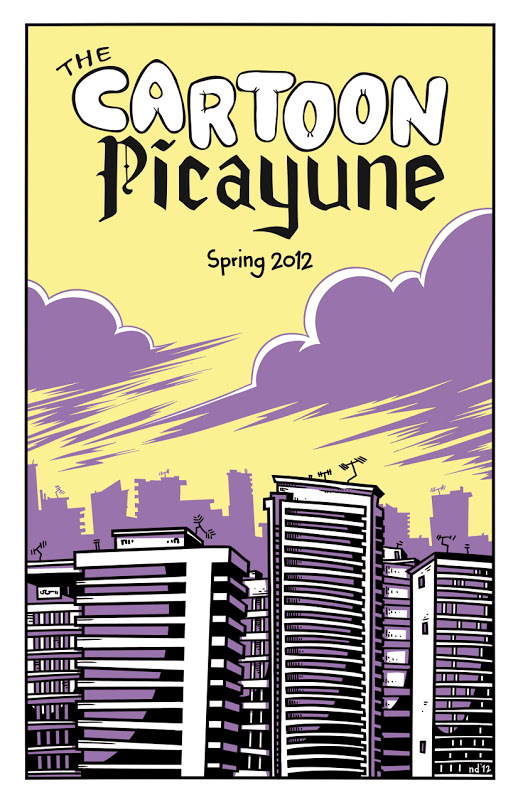 The third issue (Spring 2012) features "The Man Who Built Beirut" by Andy Warner (which I reviewed here ) and Holliday/Rodriguez (see below for my comments on their comics). It also has a vignette that's essentially a series of interviews regarding DC charging extra for plastic or paper bags as a "clean-up" tax. Kramer is very limited as a draftsman but certainly knows how to put together a comics page, and this two-pager provided a variety of viewpoints before zeroing in on why it was important. Ethan Lener's "Julia Vericella: The Girl Who Plays Solitaire" is an interview told in first person from teh point of view of the interviewee, and it's a quick glimpse into the mind of someone who is restless and creative. Both of these pieces were a nice contrast to the longer, splashier work in this issue. 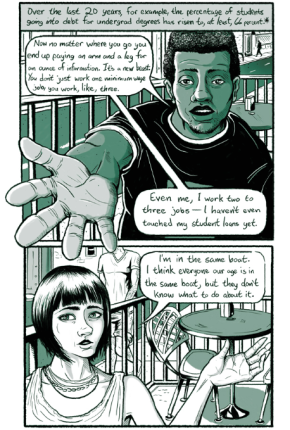 #4 (Fall 2012) continues the mix of personal interest stories, more focused news stories, stories with a political and even activist slant and even a human interest story. "Rattled!" is a humorous, first-person account of the writer's participation in a rattlesnake race in Texas. Matt Diffee is a sharp and funny illustrator who makes some wider satirical points about Texas but mostly uses the strip for self-deprecatory purposes. 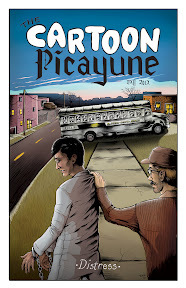 Holliday & Rodriguez return for another story printed to better effect in their book. Colin Tedford's "The Story of Jake Tuesday" is fascinating for the way it celebrates a bit of local culture and history, and how the titular character who inspired the yearly celebration found that the holiday transcended his own particular tale of life and death. "Bethesda, Maryland" is Jess Ruliffson's straightforward interview with a Marine in Walter Reed National Military Medical Center. It seeks to do nothing other than let a soldier tell his story, both of how he was injured and how he is recovering, in an effort to make this bit of hidden information visible to the public. Kramer's slowly growing more and more ambitious as he is even starting to pay his correspondents; he's accepting limited advertising in order to do so. 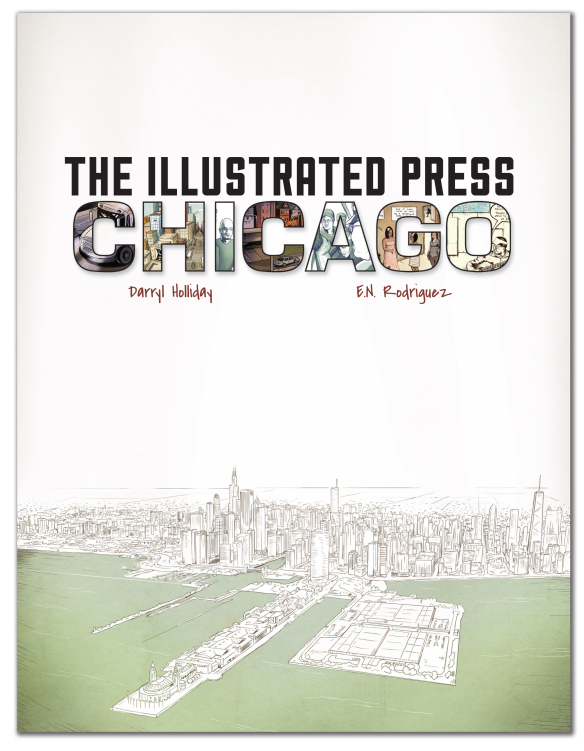 The Illustrated Press: Chicago, by Darryl Holliday and E.N. Rodriguez. This sixty-page comic is a sort of self-determined PhD project in comics journalism by Holliday (the writer) and Rodriguez (the artist). It should be noted that this duo gets more in synch as the comic proceeds; breaking up the writing and drawing tasks put them behind the curve a bit in terms of producing something that reflected both of their sensibilities in equal measure. 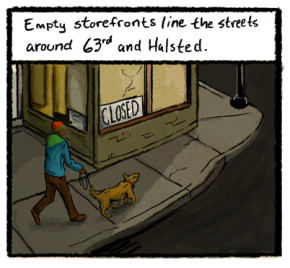 The book is essentially a love letter to their city of Chicago, though in many instances it's tough love. Arranging the book in a seasonal manner and taking it upon themselves to cover many different neighborhoods in a city that's clannish and gentrified, Holliday & Rodriguez tell their stories in a restrained, humane and dignified fashion. Even when writing more in an activist tone, Holliday is always even-handed and avoids hyperbole, relying on Rodriguez to fill in the blanks in terms of tone. Rodriguez never abuses that trust by going over-the-top in how he depicts events. Both writer and artist covered all of their events together and in person, making it a true collaboration. It should be noted that the production values for this book are top-notch, thanks to a successful Kickstarter campaign. The colors look great on the nice, thick paper. Holliday provides perspective on each story. The opener, "Wedlock", takes on a fascinating event: people getting married to inmates one day a year at the Cook County jail. It's a highly charged concept, but Holliday typically plays it low-key, letting the anecdotes speak for themselves. Neither artist nor writer had found their feet as of yet; the story is too wordy and the lettering is shaky at best. Rodriguez was also clearly an illustrator without much experience in drawing comics at the time of this story. His actual draftsmanship was fine, but the way he drew figures relating to each other in space was awkward. "Chess Records" takes an entirely different approach, with limited text and full-page illustrations in its depiction of chess players on Michigan Avenue. It's a simply-told account of the ways in which people in different walks of life come to play and why. "Inside The Crawford Coal Plant" plant reminds me more of Dan Zettwoch's strips about outdated technology than a standard piece of comics journalism. It's beautifully colored and gives the reader just a quick glimpse of a piece of technological history that's about to be put out to pasture. "Night Watch" sees Rodriguez step up his game considerably in this account of nuns drawing attention to immigrants being deported. It portrays their protests very matter-of-factly without explicitly agreeing or disagreeing with it, letting the images once again speak for themselves. The composition, the rendering and the character design were all sharp and bold, aiding the piece's overall impact greatly. "Home In One Place" is perhaps the best story in the whole book. This interview with Holliday's uncle is a survey of the city's history in a single neighborhood, documenting its rise and fall. What makes the story work as a comic was Rodriguez telling the story as we follow the uncle as he walks his dog, from left to right in each panel. This gives the reader something to grab onto and propels what is otherwise a static interview forward nicely. The use of color is muted but not to an extreme degree, as swashes of blue and green brighten up brown buildings. "The Clash On Wabash" details the ways in which a crowd and the police clashed at a NATO protest, using one or two images per page to get the story across. "Degrees of Literacy" is another static interview, this time hamstrung a bit by being set at a cafe. Rodriguez tries some tricky angles and foreshortening to liven up the visuals, but this proves to be a bit distracting. Overall, Holliday & Rodriguez are an ambitious, conscientious and thoughtful pair of journalists who are evolving into solid storytellers. Not everything worked well in this book, but it was clear that the two were well aware of their shortcomings and strove constantly to improve and try new approaches that gave their source material the respect they felt it deserved.